The spouse tables are based on the parents of 1988 respondents. People from later generations might be increasingly likely to marry outside their religion. The environment table is also based on the previous generation; again, later parents might be making different decisions about the religious environment of their children. The transmission table is based on 1988 respondents; it's possible that after 1988, children were less likely to adopt the religion they were raised in. Anecdotally, the culprits most often blamed for this effect are college and the Internet. Finally, I have not considered adult conversions from one religious identity to another. The GSS has data on these switches, so I could add them to the model. "is halved if the parents are of different faiths (even when the differences are just Methodist-Anglican). Even if the parents agree on which faith they wish to pass on, the fact of disagreement makes the child aware that there are good people in other churches and introduces the relativism that weakens conviction. [page 71]"
So if the rate of mixed marriages is increasing, that could contribute to the increasing number of Nones. RELIG: What is your religous preference? SPREL: What is your husband's/wife's religious preference? In cases where one partner converts to the other's religion before marriage, that would count (for this model) as a same-religion marriage, since we are interested in the decision the couple makes about the religious environment they raise children in. 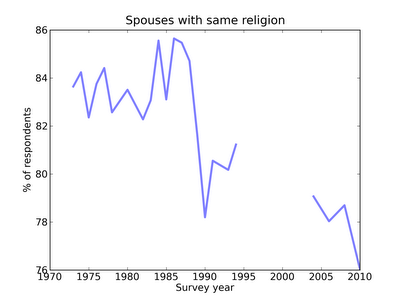 Before 1988, the fraction of same-religion marriages was around 84%; after 1988 it fell to 78%. The abruptness of the change makes me worry that it may be an artifact; for example, a chance in the wording of the question. Also, these results only include respondents who are married, so they are biased toward older people and socio-economic groups that are more likely to be married. But as it turns out, even if we take the data at face value, it has a small effect on the model's predictions. 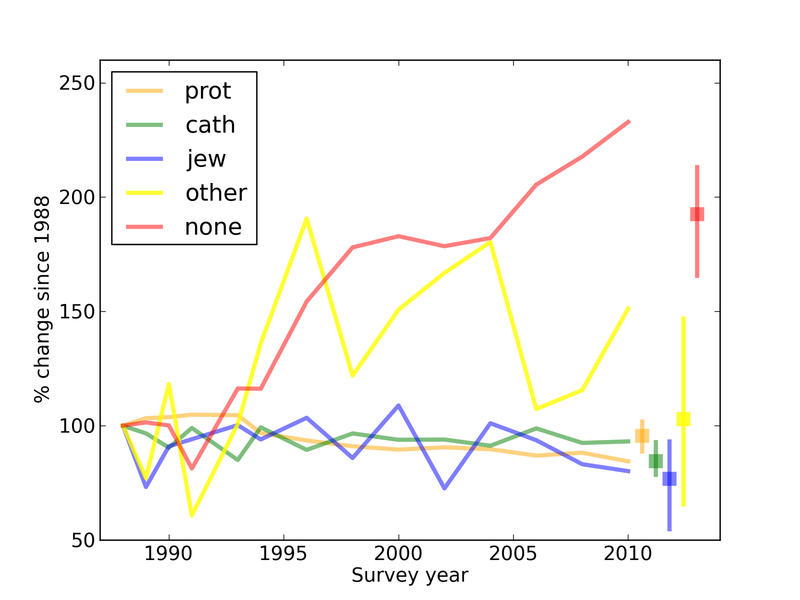 Even if we cheat by using the 2004-2010 data in 1988, this change does not explain the subsequent changes in the fractions of Protestants and Nones. It seems unlikely that parents now are making different decisions about what religious environment to raise their children in, but just to rule it out, I compared the environment tables for 1988 and 2008. The left column is the mother's-father's religion. 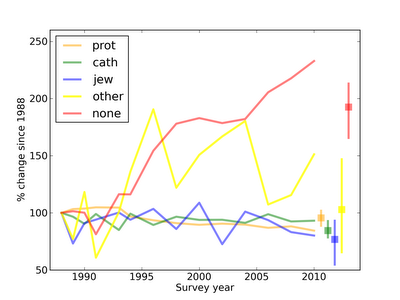 The next five columns show the religious environments those parents chose, as reported by their children in 2008. For example, the second row shows that if the mother is Protestant and the father Catholic, 43% of the children were raised Protestant, 46% Catholic, and 10% None. The next column shows the change in the None column, in percentage points, since the 1988 survey. N is the number of families in 1988 that fell into each category. Finally, Nones is the product of change and N, an estimate of the number of additional Nones in the 1988 survey that could be explained by changes in the environment table. The total of this column is 29, which is not nearly enough to explain the actual excess of 177. Of course, most of the numbers in the change column are based on small samples, so we should not take them too seriously. By running simulations with resampled survey data, we can take account of these sample sizes. 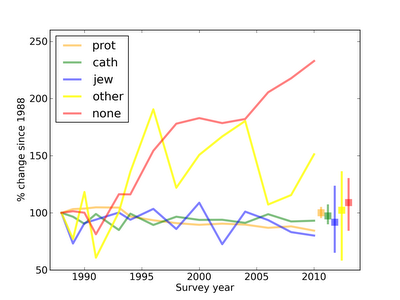 Using the tables from 1988 to predict the fractions of Nones in 2008, we expect only 8.0% (compared to the actual 16.8%). If we used the environment table from 2008, the prediction goes to 8.5%. If we also use the spouse table, it goes up to 8.7%. So clearly the changes in these tables were not enough to explain the observed changes. The transmission table is a cross-tabulation of the religion the respondent was brought up in and the religion reported when surveyed. It shows the outcome, after some years, of parents' decisions about their children's religious upbringing and the effect of the environment. Each row corresponds to a religious upbringing; each column shows a possible outcome. For example, the first row shows that of children raised Protestant, 82% report that their religious preference is Protestant, and 13% report None. The fraction of Nones has increased 7 percentage points since 1988. Since there are 951 people in this row, this increase accounts of 68 excess Nones in the 2008 survey. Overall, the changes in the transmission table account for 98 excess Nones, which is a little more than half of the observed increase. The prediction for Nones is better, but it's clear that this model still misses the mark: it predicts that the fraction of Catholics should be going down, and fails to predict the decrease in the fraction of Protestants. The problem is that I am treating everyone interviewed in 1988 as a cohort, but they represent people of all ages, who were raised in different environments. Also, I am using data from 2008 to predict what will happen in 2008, so I have got away from the original goal, to see whether the changes that occurred between 1988 and 2008 could have been predicted in 1988. However, this model has given me some leads. 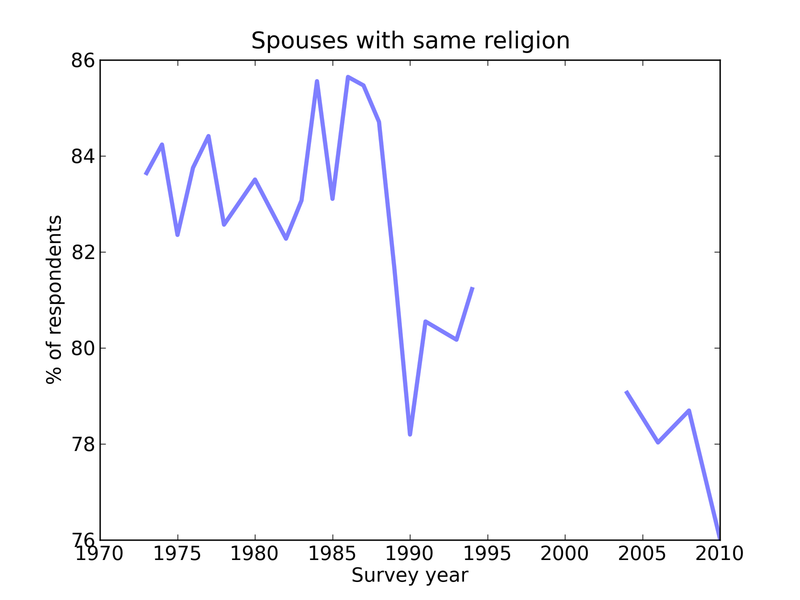 It looks like a large part of the increase in Nones is due to changes in the transmission table, possibly a small part due to the environment table, and little or none due to the spouse tables. Next time I will present a different model that reorganizes respondents into cohorts by age of birth, which will make it possible to compare people raised over the same time span. It will also allow me to look for trends that began prior to 1988.